I have been trying to make muffins or bread with poppy seeds for months now and I had the hardest time finding poppy seeds. None of the grocery stores I went to carried them…so weird. Anyways, I finally found them at a little store during a visit to my hometown for their community day. This recipe is perfect to make as a gift, whether it’s a housewarming, new baby or just because. My baking usually ends up in the “just because” category and my coworkers are the ones who usually enjoy the deliciousness. 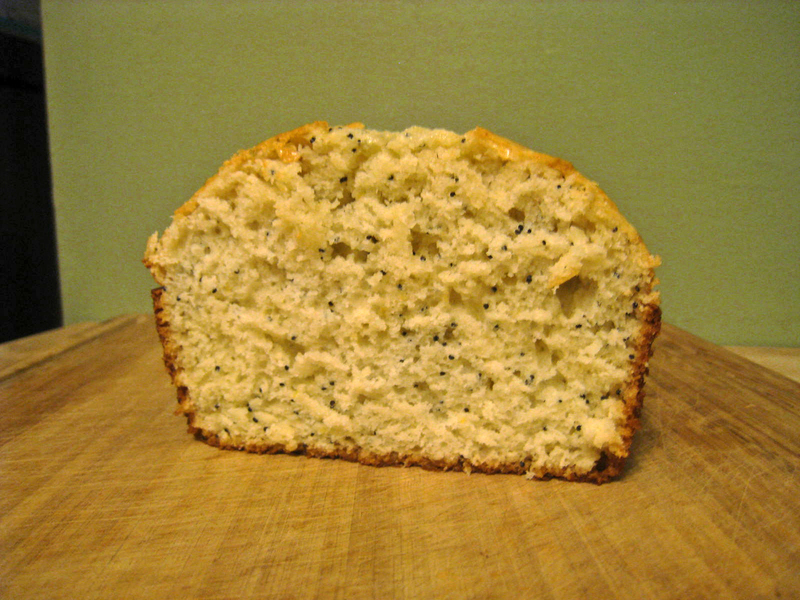 The poppy seeds added a nice texture and the lemon was subtle and not overpowering. Preheat oven to 350 degrees. Grease the bottom and 1/2 inch up the sides of a loaf pan. Set aside. In a large bowl, sift together the flour, sugar, baking soda and salt. Make a well in the center of the flour mixture and set aside. In a medium bowl, combine the egg, milk, oil, lemon peel and juice and poppy seeds. Add the egg mixture all at once to the flour mixture. Sitr until just moistened, the batter will be lumpy. Spoon batter into the prepared pan. Bake for 50 to 55 minutes or until a toothpick inserted in the center of the loaf comes out clean. Cool in the pan on a wire rack for 10 minutes. Remove frome the pan to completely cool on a wire rack. Wrap and store overnight before slicing.